Head Groundskeeper Marty Wallace clears a drain so the Generals and Stars can play Thursday night. Picture taken by season ticket holder Leigh Ann Browning. TODAY’S GAME: the Generals look to break a 2-game losing skid as they play game #4 of a 5-game series with the Huntsville Stars tonight at The Ballpark at Jackson…Jackson has won the past 2 series over Birmingham (3-2) and Montgomery (3-2) coming into this series…the Generals are 4-4 against Huntsville this season and will play their North Division rivals 20 times in 2013. 24-year-old Chance Ruffin makes his 10th career start and 10th of the season tonight. Ruffin has been hot in the month of May posting a 2.25 ERA striking out 23 and walking just 2. GENERALS RECAP: The Generals scored 3 runs in the 7th inning on a 3-run home run by 1B Rich Poythress, but it wasn’t enough as Jackson lost 3-6 to Huntsville on Thursday night. SS Gabriel Noriega (2×4, R) led the team with 2 hits, while Poythress (1×4, R, HR, 3 RBI) knocked in all 3 of the Generals runs. RF Julio Morban (1×4) recorded the team’s only other hit. Starter Roenis Elias (5.1,7,6,5,4,6,HR) recorded his 5th loss of the season, allowing 6 runs (5 ER) on 7 hits in 5.1 innings. Relievers Tyler Burgoon (1.2,0,0,0,0,4), LH Nick Hill (1.0,0,0,0,0,0) and RH Carson Smith (1.0,1,0,0,0,2) combined to hold the Stars scoreless over the final 3.2 innings. YOU ALREADY KNOW… that Huntsville is 24-29 and 9 games back in the North Division standings. But, DID YOU KNOW?…that Huntsville is T-2nd in the league with a 15-13 record in May and have led the league with 26 home runs during the month of May. 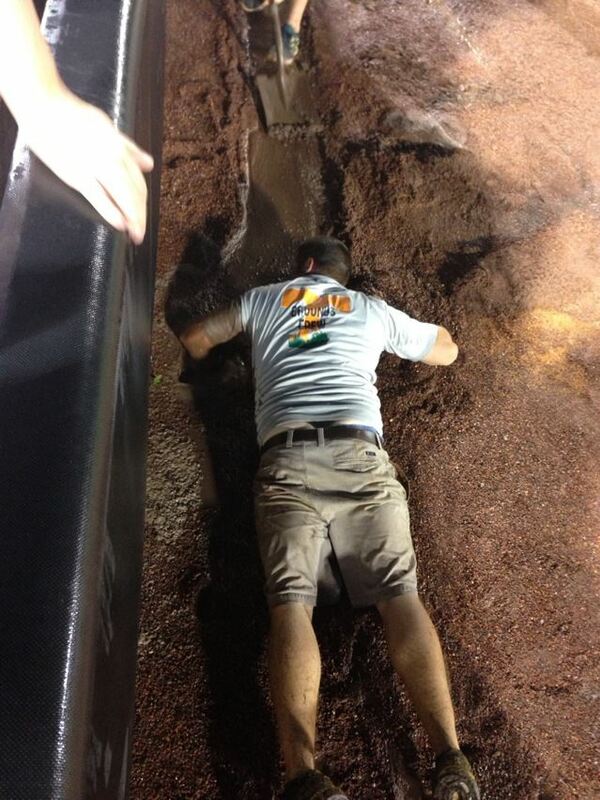 Also DID YOU KNOW?…that last night’s 6-3 loss was only the 5th loss during the month of May by more than 1 run. NEWS & NOTES: 24 of first 51 games have been 1-run games (7-17) which is the most in all of minors…30 of 51 games have been decided by 2-or-fewer runs (9-21) and 6 have been extra-inning games (2-4)…In games decided by 3+ runs the Generals are 13-7. • The Seattle Generals…their are currently 4 players on the Mariners active roster that were members of the 2012 Jackson Generals (INF Nick Franklin, C Jesus Sucre, RHP Carter Capps and RHP Yoervis Medina). In total, 5 2012 Generals have made their MLB debuts. • OF Julio Morban has hit safely in each of his last 4 games, batting .333 (6×18) with 1 run scored, 1 double and 1 RBI. • After allowing 2 runs in his first relief outing on April 5, LH Nick Hill has allowed only 3 runs in his last 20.1 innings. Overall this season he has limited opponents to a .192 (14×73) average, while walking 10 and striking out 15. • RH Carson Smith held opponents scoreless over his last 8.0 innings (8 G), while not allowing an earned run in his last 11.0 innings in relief. After allowing 2 runs in back-to-back outings April 17 and 19, Smith has lowered his season ERA from 8.44 to 2.76. During this 10 game span, he has limited opponent to a .128 (5×39), while walking 1 and striking out 15. Smith has struck out at least 1 batter in each of his 16 appearances this season (21). • LH Kyle Hunter has not allowed a run in his last 8.2 innings in relief (4 G). During this stretch he has limited opponets to a .133 (4×30) average, while walking 3 and striking out 10. • RH Stephen Kohlscheen has not allowed a run in his last 13.0 innings in relief (8 G). He has allowed only 1 run in his last 20.0 innings in relief. During this stretch he limited opponent to a .137 (10×73) average, while walking 3 and striking out 25. Since April 21, Kohlscheen has lowered his season ERA from 6.35 to 1.75 in 11 games in relief. • RHP Taijuan Walker allowed 11 earned runs over his last 4 starts (23.0 innings), after allowing only 2 earned runs in his previous 5 starts (6 R) from April 10- May 1. Overall this season, he is 3-5 with a 2.59 ERA (17 ER, 52.0 IP) in 9 starts. He has limited opponents to a .197 (37×188) average, while walking 25 and striking out 57. • We Gotcha! !…Jackson catchers lead the SL catching 55.3% of base stealers (26 CS, 47 Att). The next closest is Jacksonville which is throwing out 39% of base runners. 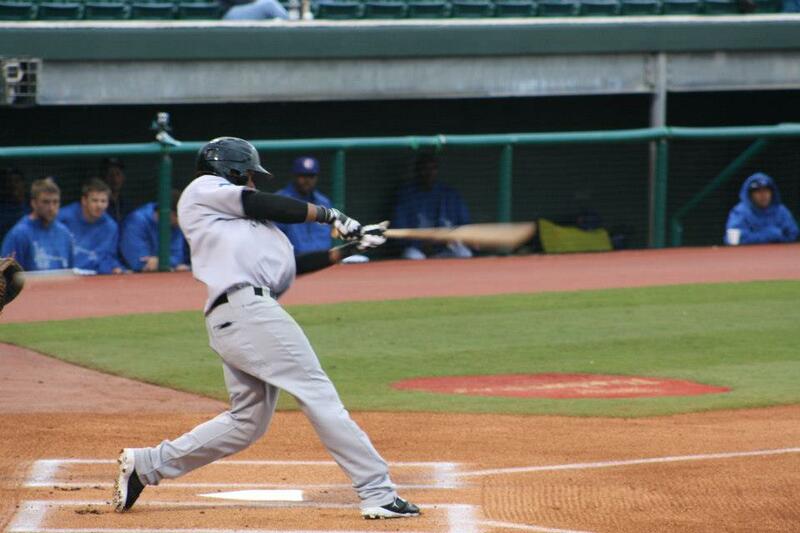 Abraham Almonte had 6 hits for Tacoma last night in their 25-6 win at Colorado Springs. TODAY’S GAME: the Generals play the middle game of their 5-game series with the Huntsville Stars tonight at The Ballpark at Jackson…Jackson has won the past 2 series over Birmingham (3-2) and Montgomery (3-2) coming into this series…the Generals are 4-3 against Huntsville this season and will play their North Division rivals 20 times in 2013. 24-year-old Roenis Elias makes his 10th start for the Generals tonight and 2nd against Huntsville…his 44th overall start in his career. Jackson is 3-6 in his starts this season despite his 2.88 ERA in those games. GENERALS RECAP: The Generals scored 4 runs over the final 3 innings, but their rally fell short at Jackson lost to Huntsville 6-5 on Wendesday night. The game marked the 24th one-run contest Jackson has participated in and have gone 7-17 in those games. The Generals out-hit the Stars 11-10, including multi-hit contests by CF Denny Almonte (2×6, 2 R, HR, RBI), LF James Jones (2×5, 2 RBI, SB) and RF Julio Morban (2×5, 2B). Almonte recorded his 2nd home run of the season with a solo blast to lead off the 7th inning, while DH Vinnie Catricala (1×3, R, HR, RBI, 2 BB) hit solo home run to lead off the 9th inning, his 3rd of the season. Starter Anthony Fernandez (4.2,5,4,4,1,6) recorded his first loss of the season, allowing 4 runs on 5 hits and struck out 6 in 4.2 innings. RH Moises Hernandez (2.1,4,2,2,1,2,HR) allowed 2 runs, including a solo home run in the 6th inning, while LF Kyle Hunter (2.0,1,0,0,0,1,0) tossed 2.0 scoreless innings in relief. NEWS & NOTES: 24 of first 50 games have been 1-run games (7-17) which is the most in all of minors…30 of 50 games have been decided by 2-or-fewer runs (9-21) and 6 have been extra-inning games (2-4)…In games decided by 3+ runs the Generals are 13-6. • The Seattle Generals…there are currently 4 players on the Mariners active roster that were members of the 2012 Jackson Generals (INF Nick Franklin, C Jesus Sucre, RHP Carter Capps and RHP Yoervis Medina). In total, 5 2012 Generals have made their MLB debuts. • Triple-A Tacoma’s bats go crazy… The Rainiers recorded 30 hits and cruised past Colorado Springs 25-6 on Wednesday night. Tacoma collected the franchise’s most hits and runs scored in a single game since the Rainiers era began in 1995. The Rainiers recorded 5-or-more runs in 3 different innings. Tacoma’s lead grew to as large as 25-1 after posting a season high 7 runs in the 7th. Four Rainiers recorded at least 4 hits, and a total of 9 players turned in multi-hit outings. 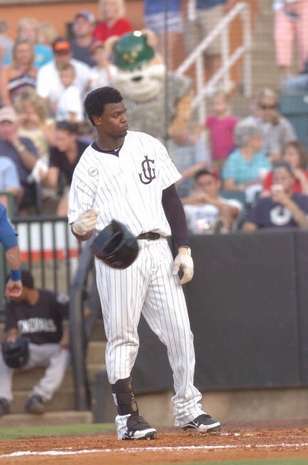 CF Abraham Almonte (6×6, 4 R, 2 RBI, BB) recorded 6 singles and became the first Rainiers player to collect 6 hits in a single game since Jerry Owens in 2005. • We Gotcha! !…Jackson catchers lead the SL catching 54.2% of base stealers (26 CS, 48 Att). The next closest is Jacksonville which is throwing out 39% of base runners. Today’s pregame interview is Generals’ outfielder Denny Almonte. He is making the transition from being a switch hitter to solely hitting right-handed. 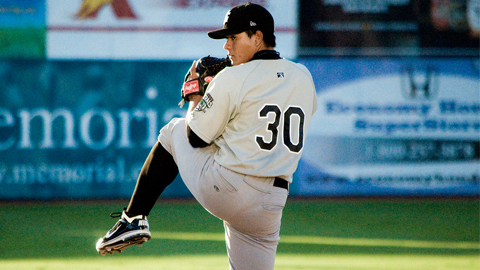 Almonte got off to a slow start with Tacoma, but has hit well for Jackson. In 23 at-bats he is batting .304 with a home run and 3 RBI. Check out the full audio below. TODAY’S GAME: the Generals face the Huntsville Stars tonight in game #2 of a 5-game series at The Ballpark at Jackson…Jackson has won the past 2 series over Birmingham (3-2) and Montgomery (3-2)…the Generals are 4-2 against Huntsville this season and will play their North Division rivals 20 times in 2013. 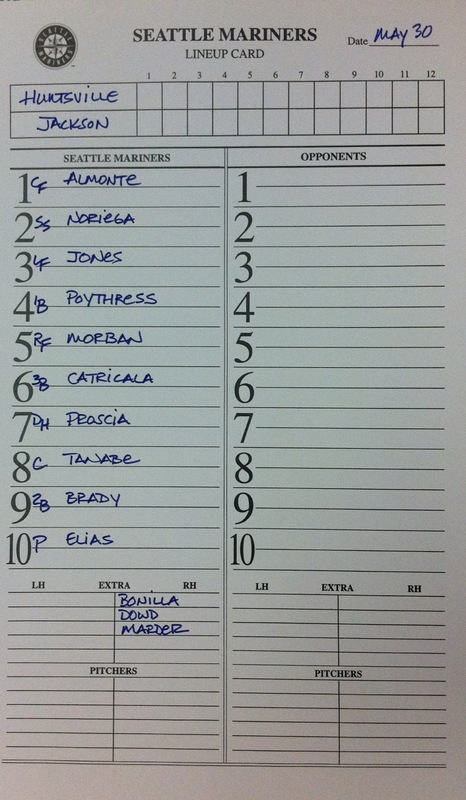 22-year-old Anthony Fernandez makes his 6th start of the year tonight for Jackson. In 3 career starts against Huntsville Fernandez is 2-1, with a 5.63 ERA. He made a start earlier this season against Huntsville on 5/11 and picked up the win. GENERALS RECAP: RF James Jones hit a walk-off 1-out RBI single as Jackson defeated Huntsville 5-4 on Tuesday night. The game marked the 23rd one-run contest Jackson has participated in and only its 7th win. The Generals held a 4-2 lead before allowing the Stars to tie the game with a run in the 7th and 9th inning. Starter Erasmo Ramirez, who was reinstated from the disabled list earlier in the day, allowed 2 runs (1 ER) on 3 hits in 5.0 innings in his 2013 season debut. Ramirez walked 2 and struck out 3, while throwing 71 pitchers (41 strikes). LH Nick Hill (1.2,2,1,1,1,1) allowed 1 run in 1.2 innings, while RH Stephen Kohlscheen (1.1,0,0,0,0,1) tossed 1.1 scoreless innings. RH Tyler Burgoon (1.0,2,1,1,1,1,HR) recorded his 3rd win of the season, despite allowing a game-tying home run in the top of the 9th inning. CF Denny Almonte (2×4, R, RBI), RF James Jones (2×5, RBI), C Michael Dowd (2×5, R, 2B), SS Gabriel Noriega (2×4, 2 R) and PH/2B Leury Bonilla (2×3, RBI) each recorded 2 of Jackson’s 12 hits. YOU ALREADY KNOW…that the Generals walked off with the 5-4 win in the 9th last night. But, DID YOU KNOW?…that was Jackson’s 23rd 1-run game moving again past AAA Gwinnett (ATL) of the International League for the most 1-run games in Minor League Baseball. NEWS & NOTES: 23 of first 49 games have been 1-run games (7-16) which is the most in all of minors…29 of 49 games have been decided by 2-or-fewer runs (9-20) and 6 have been extra-inning games (2-4)…In games decided by 3+ runs the Generals are 13-6. 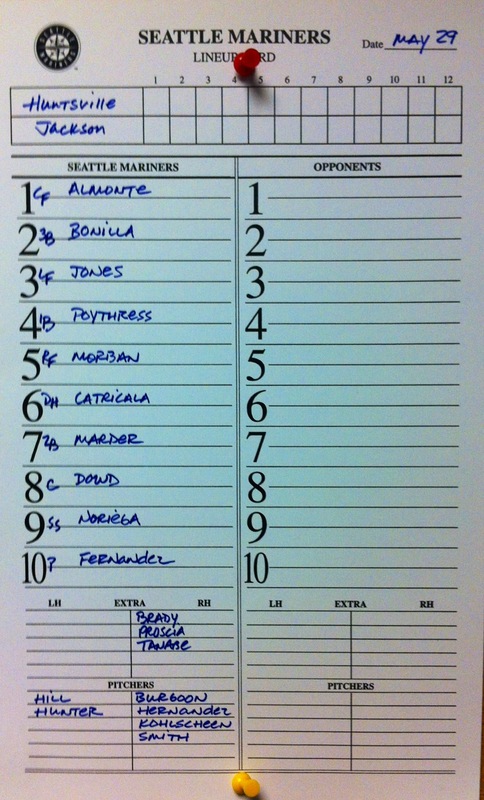 • The Seattle Generals…In yesterday’s 6-1 loss to San Diego 2012 Generals C Jesus Sucre and 2B Nick Franklin were in the lineup and Brandon Maurer started on the mound, suffering the loss. Sucre caught 17 of Maurer’s 24 starts in Jackson last year. • LH Kyle Hunter has not allowed a run in his last 6.2 innings in relief (3 G). During this stretch he has limited opponets to a .130 (3×23) average, while walking 3 and striking out 9. • RH Carson Smith held opponents scoreless over his last 7.0 innings (7 G), while not allowing an earned run in his last 10.0 innings in relief. After allowing 2 runs in back-to-back outings April 17 and 19, Smith has lowered his season ERA from 8.44 to 2.93. During this 9 game span, he has limited opponent to a .114 (4×35), while walking 1 and striking out 13. • We Gotcha! !…Jackson catchers lead the SL catching 56.8% of base stealers (25 CS, 44 Att). The next closest is Jacksonville which is throwing out 39% of base runners. The Generals walked off with a 5-4 win over Huntsville on Tuesday night. RHP Erasmo Ramirez went 5 innings and allowed 2 runs, 1 earned on 3 hits, walking 2 and striking out 3. Grant Braden caught up with Ramirez after the game. Also check out the radio highlight package from tonight’s game with calls from Chris Harris. TODAY’S GAME: the Generals face the Huntsville Stars tonight in the first of a 5-game series at The Ballpark at Jackson…Jackson has won the past 2 series over Birmingham (3-2) and Montgomery (3-2)…this season the Generals are 3-2 against Huntsville and will play their North Division rivals 20 times. 23-year-old right-hander Erasmo Ramirez makes the start for Jackson. 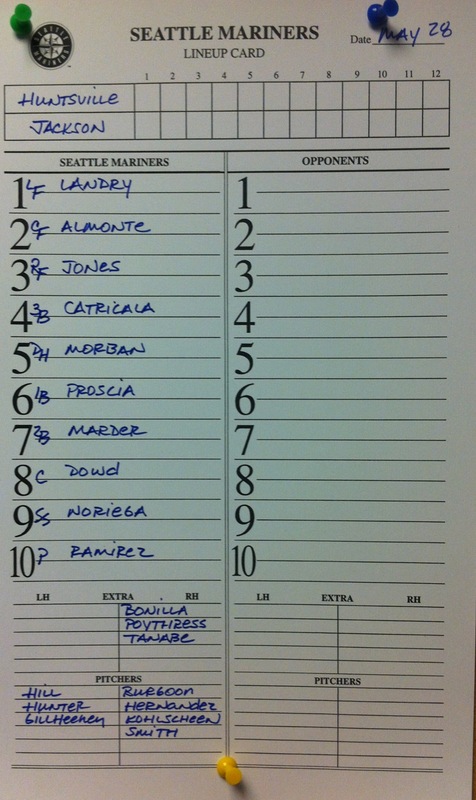 Ramirez’ last Jackson start came on 7/27/11 at Chattanooga. 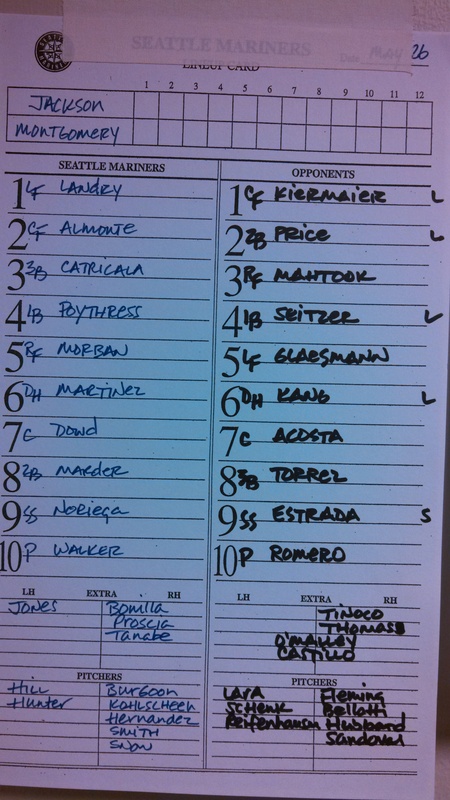 Ramirez was optioned to Tacoma on 3/27 and began the season on the Tacoma DL. This is his first start of the season. GENERALS RECAP: The Generals scored a run in the top of the 6th inning to tie the game 3-3 and scored 6 runs in the top of the 8th inning as Jackson defeated Montgomery 9-3 on Sunday afternoon. Seven of the 9 players in the Generals starting lineup knocked in at least 1 run, including 2 RBI by C Carlton Tanabe (1×3, R, 2 RBI, BB) and SS Gabriel Noriega (1×4, 2 RBI). 3B Vinnie Catricala (2×4, R, BB), RF Julio Morban (2×5, R, RBI) and 1B Rich Poythress (2×3, 3 R, 2B, HR, RBI, 2 BB) each recorded 2 of the Generals 10 hits. Starter Brett Shankin (5.1,7,3,3,4,3) allowed 3 runs on 7 hits in 5.1 innings, but didn’t figure into the decision. RH Moises Hernandez (1.2,0,0,0,0,0) earned his first win of the season, tossing 1.2 scoreless innings in relief. LH Kyle Hunter (1.0,0,0,0,0,1) and RH Carson Smith (1.0,1,0,0,0,1) combined to hold the Biscuits scoreless over the final 2.0 innings to secure the win. YOU ALREADY KNOW…that RHP Erasmo Ramirez will make his 1st start of the season tonight. But, DID YOU KNOW?…that he is the 9th different starting pitcher the Generals have had this season (Elias, Fernandez, Gillheeney, Hunter, Noesi, Ruffin, Shankin and Walker are the others. NEWS & NOTES: 22 of first 48 games have been 1-run games (6-16) which is 2nd in all of minors…28 of 48 games have been decided by 2-or-fewer runs (8-20) and 6 have been extra-inning games (2-4)…In games decided by 3+ runs the Generals are 13-6. 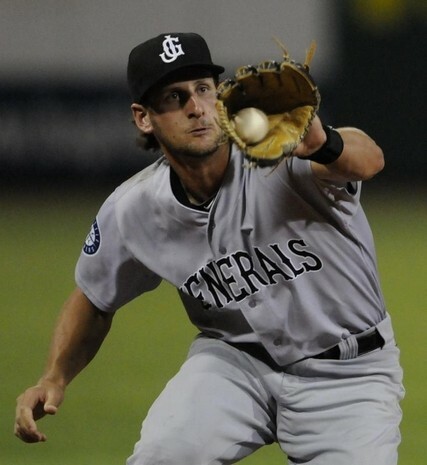 • The Seattle Generals…with the addition of Nick Franklin to the Mariners active roster Monday, now 5 members of the 2012 Generals are on the roster. 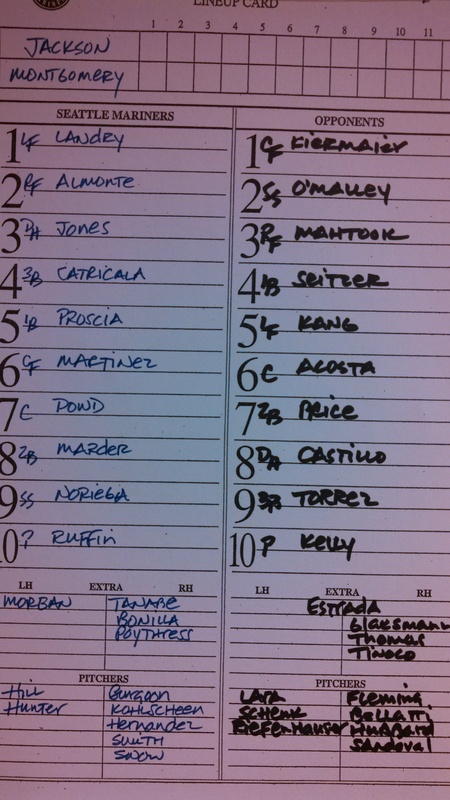 INF Nick Franklin, C Jesus Sucre, RHP Brandon Maurer, RHP Yoervis Medina and RHP Carter Capps. • OF Leon Landry went 0-for-5 yesterday, snapping his hitting streak at 7 games. During the streak he hit .333 (9×27) with 5 runs scored, 2 doubles, 2 home runs and 4 RBI. • RH Stephen Kohlscheen has not allowed a run in his last 11.1 innings in relief (6 G). He has allowed only 1 run in his last 18.1 innings in relief. During this stretch he limited opponent to a .147 (10×68) average, while walking 3 and striking out 23. Since April 21, Kohlscheen has lowered his season ERA from 6.35 to 1.88 in 9 games in relief. • After allowing 2 runs in his first relief outing on April 5, LH Nick Hill has allowed only 3 runs in his last 19.1 innings. Overall this season he has limited opponents to a .200 (14×70) average, while walking 10 and striking out 15. • RHP Taijuan Walker currently ranks 6th in the SL with a 2.59 ERA, 1st in strikeouts with 63, 3rd in innings pitched, 59.0, 2nd in opponents batting average, .190 and1st in strikeouts per 9 innings, 9.61. • We Gotcha! !…Jackson catchers lead the SL catching 56.8% of base stealers (24 CS, 43 Att). The next closest is Jacksonville which is throwing out 39.5% of base runners. Power threats: Jason Rogers (10 HR) and Brock Kjeldgaard (9 HR) lead the Southern League in long balls. These two average a home run every 19 at-bats. Jason Rogers: In addition to the power, Rogers should be considered an all-around offensive stud. Here are his rankings in the Southern League: leader in RBIs (42), extra-base hits (26) and total bases (105), 2nd in hits (57), 3rd in doubles (14) and slugging percentage (.536) and the 7th best hitter overall (.291). Lack of contact: Huntsville hitters have struck out 382 times, second most in the league. Control: With a 4.12 ERA, Huntsville pitching is second worst in the league. It seems that much of their woes stem from a control shortage. They have given up the second most free passes (203), while delivering 35 wild pitches. Jimmy Nelson (5-3, 2.98) and Ariel Pena (4-3, 2.77) are definitely their two best starters/most consistent pitchers. Nelson dominated the Generals earlier this season (6 IP, 0 ER, 3 H), but his last five starts have been a struggle. In those starts, Nelson has a 4.81 ERA and allowed 30 hits. Radio: 96.5 ESPN Radio (pregame 1:50) / GAMEDAY AUDIO and TuneIn Radio App. TODAY’S GAME: The Generals wrap up their 5-game road series this afternoon in Montgomery against the Biscuits with the rubber game of the 5-game series…A rubber match of the series has been played in 5 of Jackson’s last 6 series and 6 of the 10 overall. 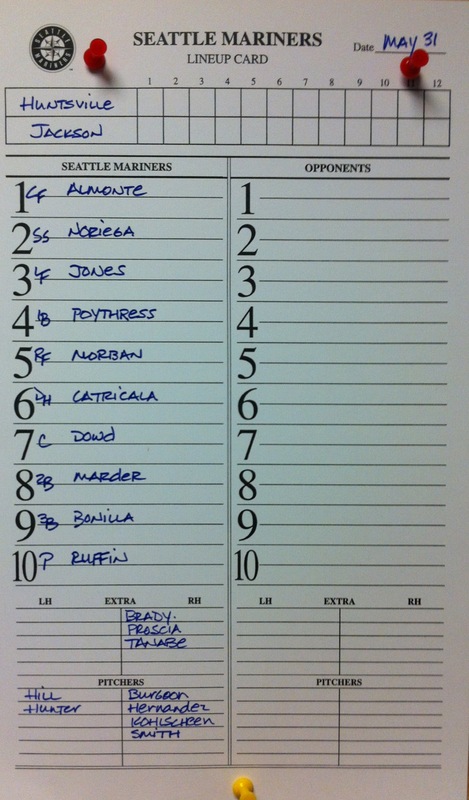 23-year-old righty Brett Shankin makes his 8th Generals start in game 5 of the series. Shankin will be making his 34th career start. GENERALS RECAP: Sunday night was once again a haunting 1-run loss for the Generals as they fell 1-0 to Montgomery. Another solid outing for Taijuan Walker fell short due to a lack of offense by the Generals and a great pitching performance by Montgomery starter Enny Romero. For the second time in two nights, Generals’ LF Leon Landry (1-4, 1B) led the game off with a hit. Even though Landry did not score, the single extended his hitting streak to 7 games. In the bottom half, Biscuits RF Mikie Mahtook got the best of a Walker’s hanging 1-2 curveball and homered to left to take the 1-0 advantage. Generals’ ace Taijuan Walker (L, 3-5, 7.0,3,1,1,2,6,1) dealt one of his best outings this year, but suffered the loss. Jackson was 0-for-6 with runners in scoring position. Enny Romero (W, 3-1, 6.0,3,0,0,1,5,0) notched the win for Montgomery. YOU ALREADY KNOW…that Jackson out-hit Montgomery on Sunday 4-3. But, DID YOU KNOW?…that in 12 of Jackson’s 26 losses this season the Generals have out-hit their opponents. NEWS & NOTES: 22 of first 47 games have been 1-run games (6-16) which is 2nd in all of minors…28 of 47 games have been decided by 2-or-fewer runs (8-20) and 6 have been extra-inning games (2-4)…In games decided by 3+ runs the Generals are 12-6. • Snow On The Go…RHP Forrest Snow was promoted to AAA Tacoma today and will make a spot start today for the Rainiers as they wrap up their series in Reno. Snow was 1-5, with a 3.58 ERA in 17 relief outings for the Generals this season. • Gillheeney Returns…LHP James Gillheeney suffered the loss yesterday for AAA Tacoma and has been sent back down to Jackson. In 6 starts in Tacoma James was 2-2, with a 4.50 ERA. With Jackson this season Gillheeney was 2-0, with a 1.21 ERA in 4 starts. • OF Leon Landry currently has a 7-game hit streak, batting .333 (9×27) with 5 runs scored, 2 doubles, 2 home runs and 4 RBI. He also has reached base safely in 15 straight games which is the longest active streak in the Southern League. • OF Julio Morban has hit safely in 16 of his last 20 games, batting .338 (25×74) with 11 runs scored, 5 doubles, 2 triples, 2 home runs and 13 RBI. During this 20-game stretch, since April 27, Morban leads the Southern League in average. • We Gotcha! !…Jackson catchers lead the SL catching 55.8% of base stealers (24 CS, 43 Att). The next closest is Jacksonville which is throwing out 40.5% of base runners. Radio: 96.5 ESPN Radio (pregame 5:50) / GAMEDAY AUDIO and TuneIn Radio App. TODAY’S GAME: The Generals continue their 5-game road series tonight in Montgomery against the Biscuits with game #4 of the series…Jackson has won 3 of their last 4 and 6 of their last 10 games. 20-year-old righty Taijuan Walker makes his team-leading 10th start of the season. This is his 53rd career start and 35th for Jackson…2nd start against Montgomery this season…allowed 3 unearned runs on 4 hits in 5 innings, walking 2 and striking out 5 on 4/10. In 4 career starts vs. MTG, 2-2, with a 2.97 ERA. GENERALS RECAP: LF Leon Landry hit a 2-run home run in the 3rd inning as Jackson came-from-behind to defeat Montgomery 3-1 on Saturday night. Starter Chance Ruffin (6.0,4,1,1,0,7,HR) allowed a home run to lead off the game, but held the Buscuits scoreless over the next 5.0 innings to earn his 2nd win of the season. LH Nick Hill (2.0,1,0,0,0,1) allowed 1 hit and struck out 1 in 2.0 scoreless innings, while RH Tyler Burgoon (1.0,0,0,0,1,2) struck out 2 in the 9th inning to earn his 2nd save of the season. RF Denny Almonte (2×4, 2B, RBI) and CF Francisco Martinez (2×4) each recorded 2 of the Generals 8 hits, while Landry (1×5, R, HR, 2 RBI), DH James Jones (1×4), C Michael Dowd (1×4) and 2B Jack Marder (1×2, R, BB) each recorded 1 hit. YOU ALREADY KNOW…that Leon Landry has homered in back-to-back games. But, DID YOU KNOW?…that Landry has a 6-game hitting streak and has reached base safely in 14-straight games. The on-base streak is tied for the longest active streak in the Southern League. NEWS & NOTES: 21 of first 45 games have been 1-run games (6-15) which is 2nd in all of minors…27 of 45 games have been decided by 2-or-fewer runs (8-19) and 6 have been extra-inning games (2-4)…In games decided by 3+ runs the Generals are 12-6. • Brad Miller played short stop and hit 8th for Tacoma Saturday night and was 0-for-3 with 2 walks in his Triple-A debut. Tacoma defeated Reno, 9-5 in Reno. • OF Leon Landry currently has a 6-game hit streak, batting .348 (8×23) with 5 runs scored, 2 doubles, 2 home runs and 4 RBI. He also has reached base safely in 14 straight games. • OF Julio Morban has hit safely in 16 of his last 19 games, batting .357 (25×70) with 11 runs scored, 5 doubles, 2 triples, 2 home runs and 13 RBI. During this 19-game stretch, since April 27, Morban leads the Southern League in average. • RHP Taijuan Walker allowed 10 earned runs over his last 3 starts (16.0 innings), after allowing only 2 earned runs in his previous 5 starts (6 R) from April 10-May 1. Overall this season, he is 3-4 with a 2.77 ERA (16 ER, 52.0 IP) in 9 starts. He has limited opponents to a .197 (37×188) average, while walking 25 and striking out 57. • We Gotcha! !…Jackson catchers lead the SL catching 54.8% of base stealers (23 CS, 42 Att). The next closest is Jacksonville which is throwing out 40.5% of base runners. Radio: 96.5 ESPN Radio (pregame 6:20) / GAMEDAY AUDIO and TuneIn Radio App. 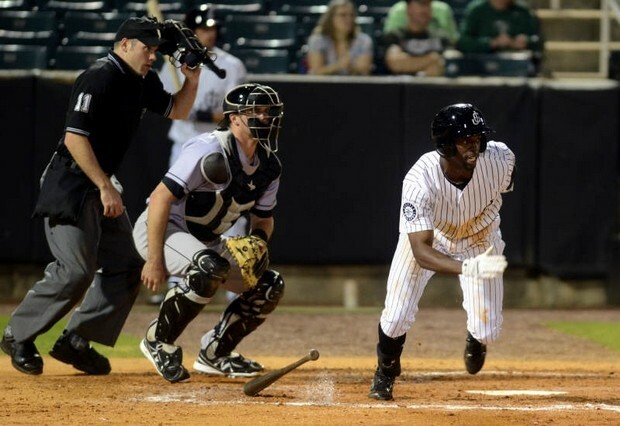 TODAY’S GAME: The Generals continue their 5-game road series tonight in Montgomery against the Biscuits with game #3 of the series…coming off 10-game homestand in which Jackson lost 3 of 5 from Tennessee then won 3 of 5 from Birmingham…Jackson took 3 of 5 from Montgomery at The Ballpark at Jackson 4/10-4/14…24-year-old Chance Ruffin makes his 9th career start and 9th of the season today against Montgomery. This is his 2nd start this season against Montgomery, with the first coming in Jackson on April 13 (ND). GENERALS RECAP: The Generals out-hit the Biscuits 9-6, but Jackson fell short losing to Montgomery 1-2 on Friday night. CF James Jones (2×4) and Jack Marder (2×4) each recorded 2 of the Generals 9 hits. LF Leon Landry (1×4, R, HR, RBI) gave the Generals and early 1-0 lead, after leading off the game with a home run, his 4th home run of the season. Starter Roenis Elias (6.2,6,2,2,3,8) recorded his 4th loss of the season, allowing 2 runs on 6 hits and striking out 8 in 6.2 innings. RH Forrest Snow (1.1,0,0,0,1,2) walked 1 and struck out 2 in 1.1 scoreless innings in relief. YOU ALREADY KNOW…that the Generals out-hit Montgomery last night 9-6. But, DID YOU KNOW?…that in 11 of Jackson’s 25 losses they have out-hit their opponents. • Roster Palooza!!! Their have been 8 roster moves affecting the Generals roster during this series. 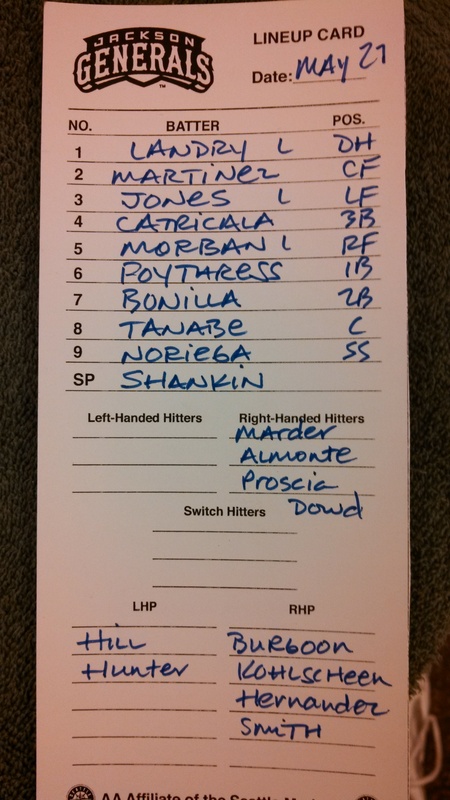 INF Rich Poythress, OF Denny Almonte, C Mike Dowd and C Carlton Tanabe have all been added. SS Brad Miller and C Brandon Bantz were each promoted to Tacoma. • OF Leon Landry currently has a 5-game hit streak, batting .389 (7×18) with 4 runs scored, 2 doubles, 1 home run and 2 RBI. • After allowing 2 runs in his first relief outing on April 5, LH Nick Hill has allowed only 3 runs in his last 17.1 innings. Overall this season he has limited opponents to a .203 (13×64) average, while walking 10 and striking out 14. LH reliever Nick Hill has allowed only 3 runs in his last 17.1 innings. Overall this season he has limited opponents to a .203 (13×64) average. • We Gotcha! !…Jackson catchers lead the SL catching 54.8% of base stealers (23 CS, 42 Att). HOSTING THE OVC: For the 4th year in a row The Ballpark at Jackson is hosting the Ohio Valley Conference Baseball Championship. This year the six-team, double-elimination tournament is going on now through Sunday and marks the 35th OVC Baseball Championship.